Now we have heard of bingo wings before, but wonder wings is a new one on us! Well Wink Bingo do have wonder wings, but not in the sense you may be thinking as this is an instant win game at their site. The top three wagerers on the wonder wings game at Wink Bingo this weekend will win £25 cash each, so if you have not tried this instant out before now might be the time to do just that. On Christmas day a secret Santa game will be coming out to play on Wink Bingo, but this game is not so secret after all as we can reveal there will be £5,000 worth of cash prizes up for grabs, plus the breakdown of how it will pay out on the night. Plus you can even win some cash from getting that dreaded 1tg or 2tg. All players who are waiting on one number will share £250 and all players waiting on two numbers will also share £250. So you can win, without actually winning! If you are going to be playing at wink over the next few days, here are all the bonus codes you need to grabs those additional bonuses on deposits made and these are all about the word (thanks) to coincide with American thanksgiving we would imagine. This entry was posted in Bingo Blog and tagged Wink Bingo on November 24, 2011 by Emma. There are already three lucky ladies in the mini cooper club at Wink Bingo and they are now looking for a forth member to join them. Up for grabs for the 4th year running is a brand new mini cooper 1.6 car at Wink Bingo and what is even more amazing about this offer is they are bringing you the chance to win this super prize effectively for free – yes free! You have two ways in which to participate in the (win a mini cooper) car game which is set to take place on New Years Day @ 8pm. 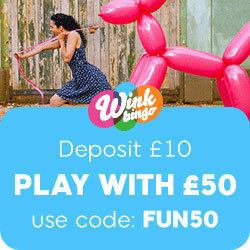 You can log onto Wink Bingo as from now and pre-purchase your cards for this game at a cost of £5 each, or alternatively you could try and win some free cards by picking up mini points. Each time you clock up 500 mini points, this will equal 1 free mini card for you and those all important points can be gained as follows. So as you can see, you really could accumulate those mini points in no time at all on Wink Bingo and these could get you lots of free cards for this fabulous win a mini game. This entry was posted in Bingo Blog and tagged Wink Bingo on October 20, 2011 by Emma. Once again Wink Bingo will host a £25K Joy Pot game. This time the game is scheduled to play on Sunday 30th October so players can gear for a spectacular Halloween jackpot game. This time the Joy Pot is a 90 ball bingo game which means there are three chances to win a share of the £25,000 cash prize. Well, it’s Halloween and everything has a trick or treat flavour. The Wink Bingo Joy Pot game too has a hefty dose of Halloween fun because they’re not revealing what you can win for each line. It just might be the traditional break up with the biggest share going to the full house winner or you might just scoop the biggest share on the very first line! The only way to find out is to play. As with all the earlier Joy Pot games there are free tickets that you can earn. Play the online bingo games and the Instant Games across the Joy of Bingo sites and earn Pot Credits. Exchange 500 Pot Credits for one free ticket to the £25K Joy Pot game. Make sure that you have the same email address for your accounts on Wink, Posh, Tasty, RedBus and on BingoStreet. That way all your Pot Credits can be merged and counted up together so you can get to 500 credits really fast. All these actions will have the Pot Credits flowing in at warp speed. Score a bingo on the Pot of Gold pattern and get 5 credits. Wager £10 on the bingo games and get 2 credits. Every £50 wagered on the Instant Games will get you 1 credit. There’s 1 credit to be earned for every bingo in the call number 25 too. Earn 20 credits in one shot by sending an email to Joy of Bingo relating your spookiest story. This action is once per alias. Tickets for the Wink Bingo £25K Joy Pot game are also available for £2 each. Pre buy a stack of tickets to make sure you don’t miss out on the game. You can then go about earning free tickets at leisure. The £25K Joy Pot game will play at 10pm on Sunday 30th October at Wink Bingo. Purchase tickets from Wink Bingo only. In the days running up to this grand £25K jackpot game, there will special chat parties and promotions at all the sites. The fun begins at 8pm and carries on till midnight. Log in to the Cheers room at Tasty Bingo and the Party Bus room at RedBus Bingo on Friday 28th October. There will be promotions through the weekend, in fact, with cash, bingo funds and fun prizes on offer. The Cocktail room at Posh Bingo and The Strip at Wink Bingo will be the venue on Saturday 29th October while the Tuck Shop room will be the centre of activity at BingoStreet on Sunday 30th October. Don’t miss the fun and excitement of a massive £25,000 cash jackpot this Halloween in the £25K Joy Pot game at Wink Bingo. This entry was posted in Bingo Blog and tagged Wink Bingo on September 15, 2011 by Emma.